Normally it would be other teams’ fans laughing at West Ham, but after comfortably retaining our Premier League status this season, it’s given us the chance to have a bit of a laugh at other club’s expense. Recently I’ve posted about the demise of Reading, QP Ahahahaha and Shitfilled United. Now we can add Newcastle to the list. Just what does Mike Ashley thinks he’s doing with the appointment of Joe Kinnear (there’s a joke in ‘ere?) as director of football? 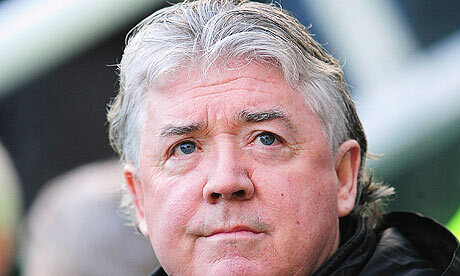 Kinnear’s football philosophy belongs to a time that should be long gone. Not even Big Fat Sam’s tactics are as antediluvian as Kinnear’s. This recording is from his time as manager at Newcastle a few years ago. Comedy gold 🙂 Warning: Naughty words – not suitable for children or those of a nervous disposition. This radio interview he gave yesterday, while giving the impression he’d consumed too much “hospitality” before going on air. It’s full of err “misinformation” and pronunciation errors. It seems from what’s been said about Kinnear’s role, that Pardew’s responsibilities have been watered down somewhat, along with those of Graham Carr, their chief scout, who has been credited with unearthing a lot of the overseas players that helped get Newcastle into the Europa Cup. I can’t see Pardew putting up with too much interference in the running of the team from Kinnear (if any at all) and I suspect he will not see out the coming season. Maybe that’s what Ashley wants, though quite why I don’t really understand. They may have come close to relegation this season, but that was probably down to them taking the Europa Cup seriously without having the playing resources to maintain that campaign alongside a decent domestic season. I can’t help feeling that we’ll be having a few more laughs at Newcastle’s expense during the next few months. On a more serious note, Kinnear has already had a heart attack, let’s hope this job doesn’t have an adverse effect on his health.